sweet potato | Clare Cooks! Posted on September 25, 2012 by Clare Cooks! I have been really into sweet potatoes lately. I believe it stems from my fruitless quest to make fall happen. There are something about sweet potatoes to that seem particularly autumnal. Autumnal also happens to be one of my favorite words, so I plan on using it as often as possible. I am a major fan of this meal. Fast, easy and it only uses one dish. It already sounds like a winner in my book. 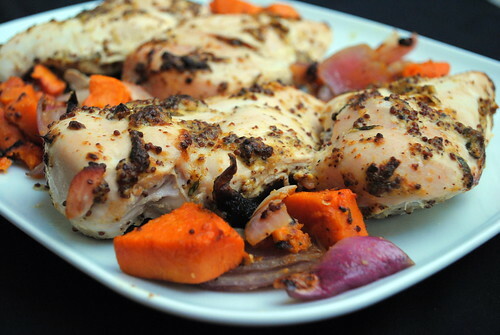 The sweet potatoes and onions cook up with this delicious, slightly caramelized flavor. I happen to really like mustard, sweet potatoes and onions, so I didn’t think twice about combining them. They turned out perfectly. The other great thing, was the amount of leftovers for lunch the next day. Next time, I might start cooking the sweet potatoes and onions before the chicken so they get a little crisper/more caramelized. Some of the vegetables that were directly under the chicken, didn’t get as crispy as I would have liked. Cooking them in a separate or bigger dish might help this as well. 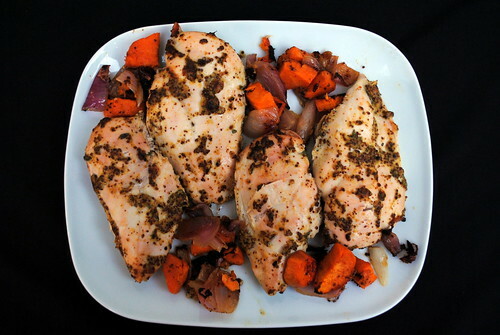 I also think you could easily substitute squash or regular potatoes as well, but I think the sweet potatoes complement the rest of the meal’s flavors that any substitute might. Posted on November 11, 2011 by Clare Cooks! There’s something that makes sweet potato fries that much better than regular fries. But it is quite easy to make bad sweet potato fries. 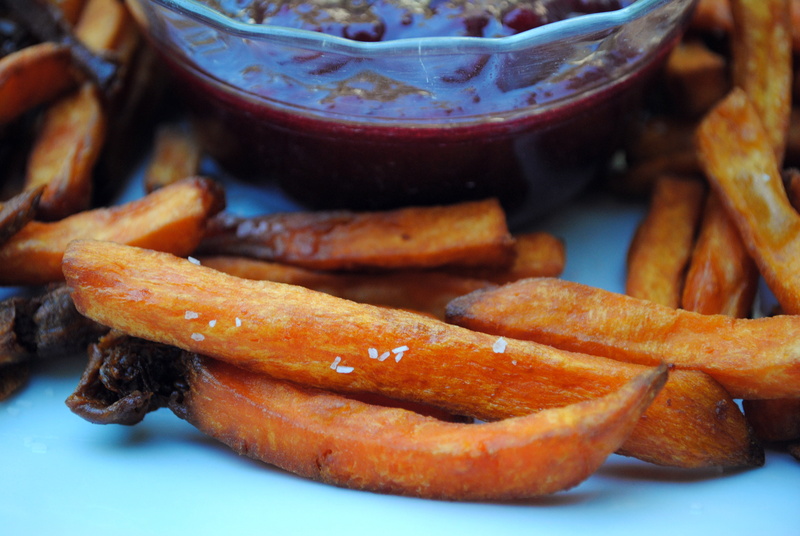 They are soggy and gross and no one likes them, but good sweet potato fries are phenomenal. 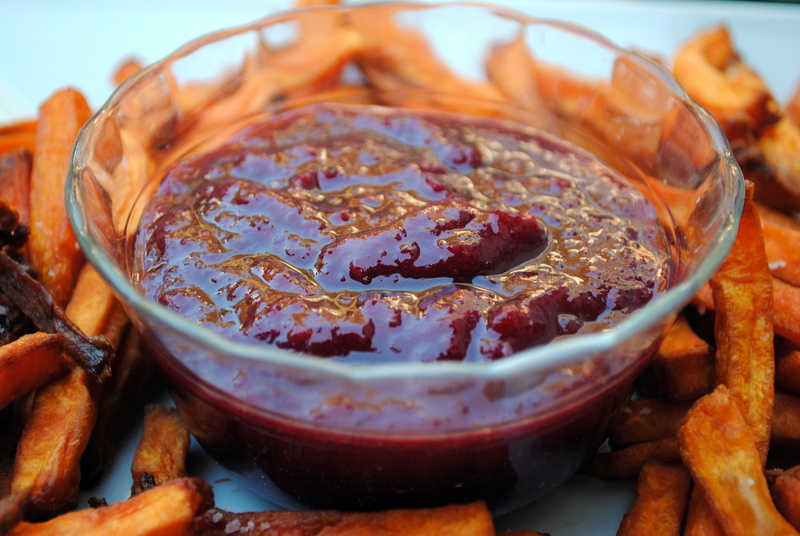 The secret to great sweet potato fries is to soak and double fry. When you cut the fries, you have to make sure to soak them in cold water to remove excess starch. Soak them 20 minutes, soak them overnight, just make sure you soak them. Now the next step to achieving the best sweet potato fries, is the double fry, which is covered in the directions below. The cranberry ketchup is phenomenal. 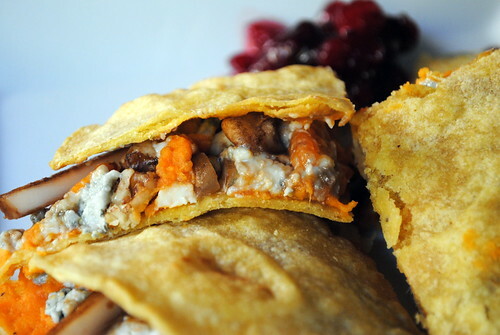 The tangy, tart bite of the cranberries goes so well with the sweet potatoes. I would imagine that with a bit of extra chopping instead of blending, that the cranberry ketchup would make a great Thanksgiving cranberry sauce. Preheat oven to 200F/95C and line large baking sheets with paper towels. Peel the sweet potatoes, rinse and cut into fries. When cut, soak in cold water to draw out the starch, at least 20 minutes. Make sure to dry the fries very well and remove as much water as possible. Heat the oil over medium-high heat. When hot (place a popcorn kernel in the oil and when it pops, the oil is hot enough) place the first batch of fries in the oil and cook for 10 minutes. Remove the sweet potatoes from oil, drain for a few seconds and place on towel-lined baking sheet to drain. Place the baking sheet in the oven. Repeat with the next batch of fries. Return the original batch of fries to the oil and cook for another 10-15 minutes or until golden and crispy, then remove from the oil with a slotted spoon, drain for a few seconds and place on towel-lined baking sheet to drain. Place baking sheet in the oven. Repeat until finished with all the batches. Sprinkle the fries with a bit of kosher salt. Serve while still hot and enjoy! Posted on October 26, 2011 by Clare Cooks! I saw this recipe and instantly knew I was going to have to make it. 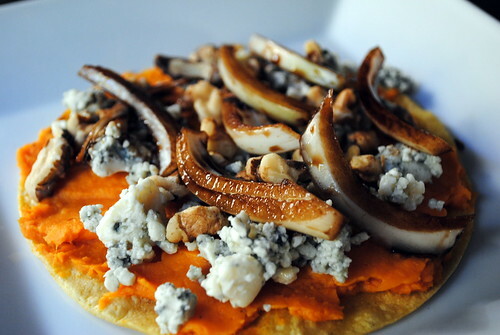 Such a tasty and colorful dish that would be perfect as a fall appetizer or as a football watching snack like Lisa recommends. The way the recipe is broken down and written makes it look like a lot more work than it is, so don’t let that intimidate you. I threw in an extra chipotle because mine were a little on the small side and I love chipotle. The sour cream and sweet potato really help calm the spiciness of the chipotles, but the flavor is still there. I also sprinkled some garlic powder on top, before I squeezed in the lime juice, just because garlic makes everything a little better. I also substituted corn for the original yellow bell pepper because I’m not really a fan of bell peppers and they are costing well over 3 dollars in these parts for one damn pepper! Outrageous! Steam the sweet potato chunks for 15-20 minutes until completely tender, and then transfer to a colander and allow to drain until dry. Once very dry, place sweet potato chunks in a large mixing bowl and mash with a potato masher to break up chunks. Add flour and finely chopped green onions, and mix with your hands to form a smooth batter. Using your hands here is best so that it doesn’t become over mixed. In a food processor, the sweet potato mixture could quickly become gummy. Taste for seasoning and add more salt and pepper if needed. Once the mixture is smooth, and the flour and green onions are mixed in, you’re ready to fry. Note: the mixture should be sticky but not wet, so more flour may be needed. In a non-stick skillet, heat two tablespoons extra virgin olive oil and two tablespoons butter over medium-high heat. Form round, flat cakes from about two tablespoons of batter per cake, and fry four or five at a time for three minutes per side until golden. Transfer finished cakes to a paper towel-lined baking sheet to drain and cool. Add more oil and butter to pan between batches as needed, and continue frying a few cakes at a time until all are ready for their toppings. Combine all salsa ingredients, starting with one chipotle, in a small bowl and stir to combine. Taste for chipotle heat and add more if desired, and taste for seasoning and add more salt if needed. Salsa can be made in advance and stored in the refrigerator. 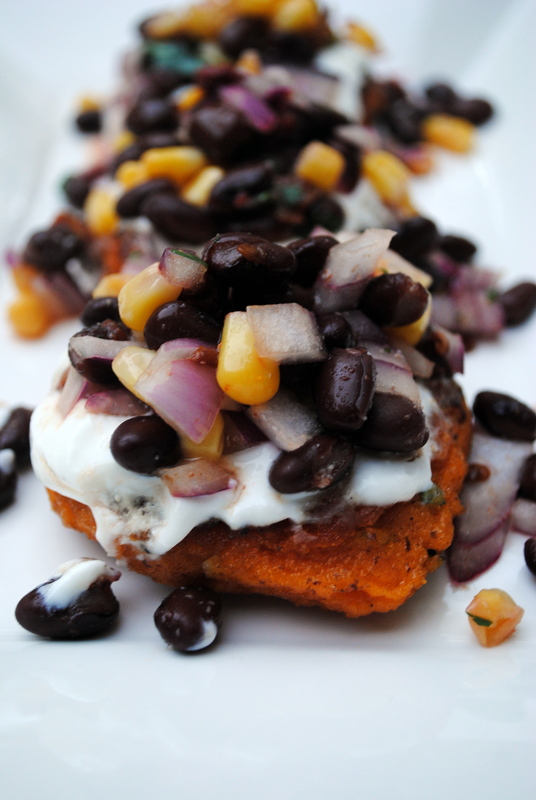 Place sweet potato cakes on a serving platter and add a small dollop of sour cream to each. 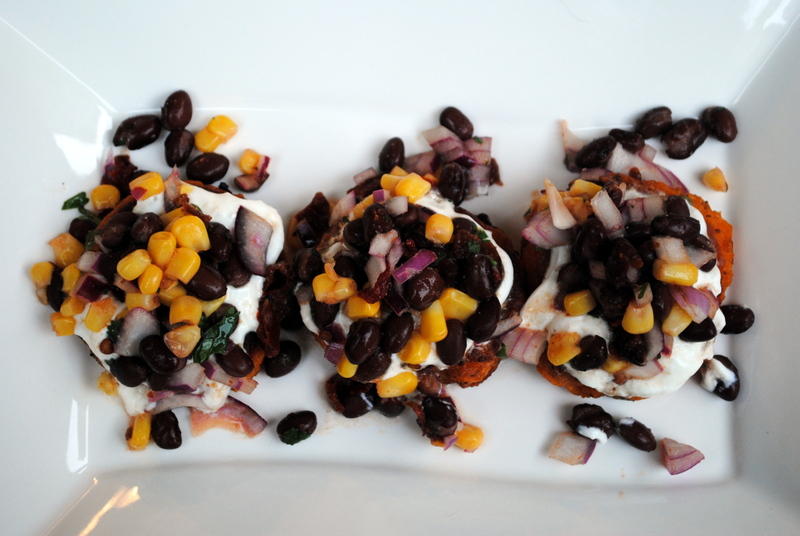 Top sour cream with a small spoonful of black bean salsa and hot sauce, if desired and enjoy.